In 2012, authors Cooper Graham and Ron van Dopperen published an article on newsreel pioneer Nelson E. Edwards. 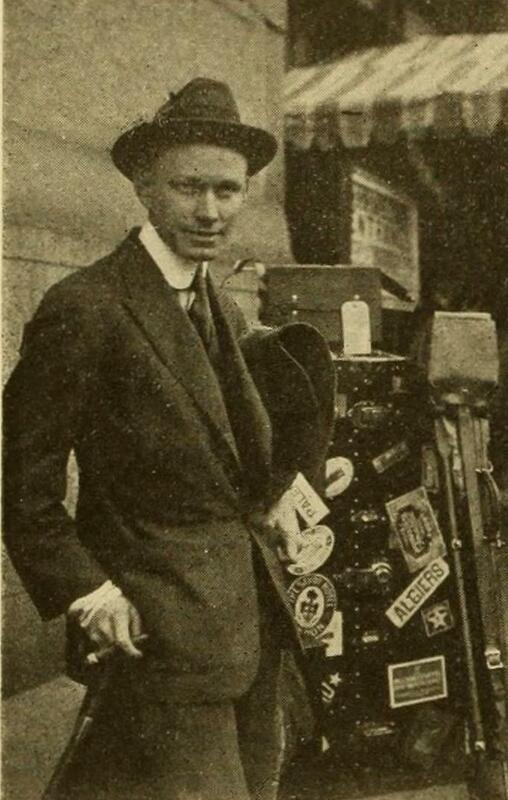 Edwards (1887–1954) was among the first newsreel cameramen in American film history. From 1914 he filmed for Hearst International News Service and covered the Mexican Revolution. In 1916 he filmed the Turkish and the German side of the World War. He was also chief cameraman for Fox Newsreel during the year of its birth, and thereafter a longtime stringer for Paramount News. The essay describes Edwards's life and work, as well as some of the background of Hearst's first attempts to get into the newsreel business, based on research in Edwards's personal documents, reports in the press and interviews with his family. Nelson Edwards's film work during World War I also featured in our book American Cinematographers in the Great War (2014). During our research on Nelson Edwards we were very fortunate in having contacted Nelson Edwards' s family who were most helpful and provided us with invaluable information from Nelson's personal scrapbooks. 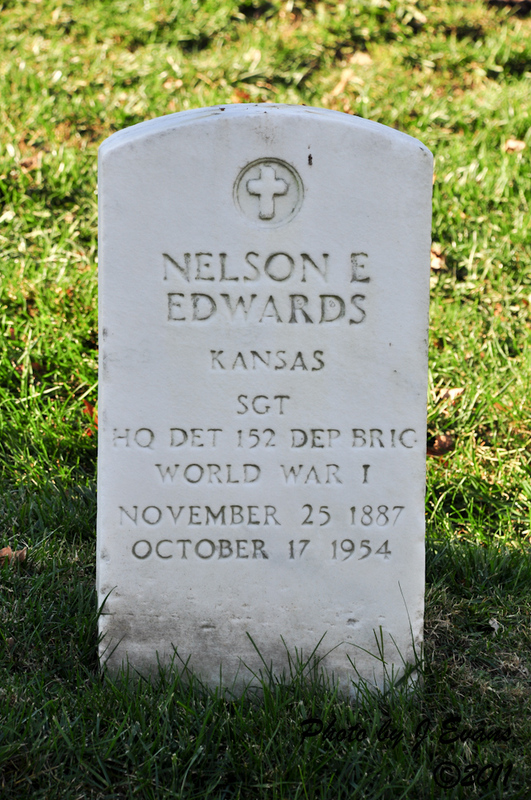 Nelson Edwards was raised in Kansas and many of his relatives are still living in the area. The family background is interesting. 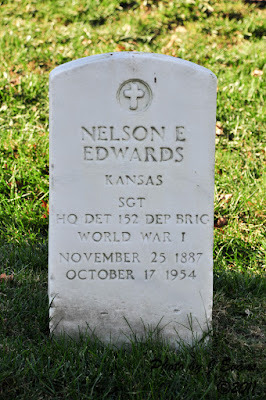 He was buried in 1954 at Arlington National Cemetery. 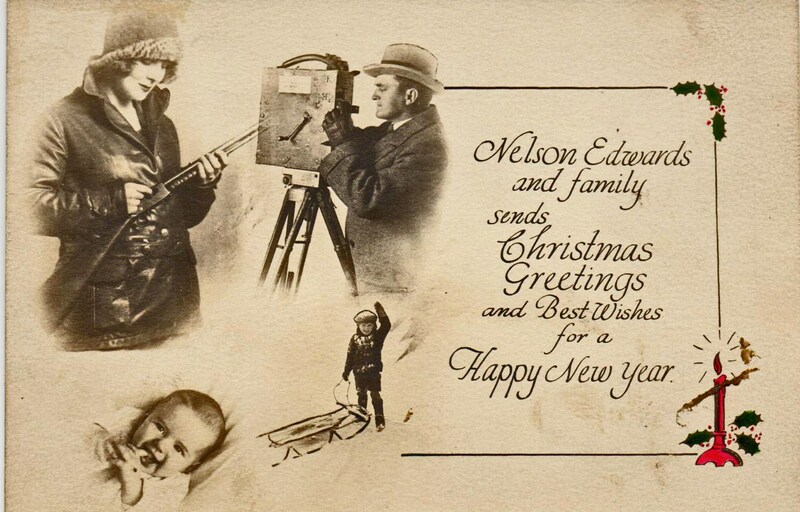 More can be found in this weblog on the Edwards family. 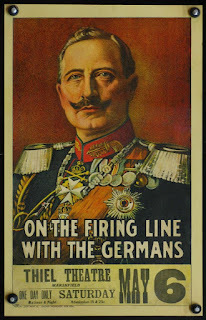 On April 15, C-SPAN3 on American History TV first broadcasted On the Firing Line with the Germans. Watch Wilbur Durborough's historic World War I film report on his experiences in wartime Europe and on the Eastern Front while the German army pushed the Russian enemy out of Poland. Durborough's film is the only American World War I feature film that has survived and an invaluable source on World War I film history. Together with his camera operator Irving Ries, Durborough spent five months with the German army. They covered operations both at the home front, in East Prussia and on the Eastern Front where in a gigantic pincer movement the Russian army was driven out of occupied Poland. We have described Durborough's film adventures in more detail in our book American Cinematographers in the Great War (2014). Based on research by authors Jim Castellan and Cooper Graham the Library of Congress recently restored Durborough's 1915 war film which is now available for the public after almost one hundred years. Lost and long forgotten, this movie provides us with an extraordinary opportunity to witness the First World War as seen through the lens of an American camera correspondent. We recently produced a new, extended story on Durborough's photographic work during World War I. You can read this Durborough Film Annotation here. In the TV show by C-SPAN George Willeman and Lynanne Schweighofer tell about their work on restoring this remarkable film. While the movie is shown Cooper Graham and Jim Castellan give comments on the historical background and on how this film was made. Here is C-SPAN's program on American History TV. Enjoy! On May 1, 1915, an American cameraman captured the final departure of the RMS Lusitania, the British ocean liner en route from New York to Liverpool, England. Of the more than 1,900 passengers and crew members on board, more than 1,100 perished, including over 120 Americans. This unique footage is now at the National Archives in Washington, D.C. The original footage comes from a contemporary American news film and shows passengers arriving at the dock and going aboard the ship. The Lusitania's flag is raised. Passengers, including author Elbert Hubbard, pose at the ship's rail. The film also has an interesting scene showing Captain Turner watching the Lusitania's departure. You can see him on film in a very short flash, looking at the camera, perhaps a little startled, when he suddenly notices that he is being covered by a movie man located on the roof of Pier 54, just slightly above him. The ship then turns toward open water and proceeds toward the North Atlantic. Six days later the Lusitania was sunk by a German submarine on this fatal voyage. This unique newsreel film has been preserved because it was edited into a compilation movie by the U.S. Signal Corps in the 1930s as part of a film series on the First World War. Its historical value is undisputed. The film has an intertitle mentioning the approval by the Pennsylvania Board of Censors, so it clearly was released in the United States. But there are no references to a production company. Both Pathé and the Hearst-Selig newsreel organization at the time claimed to have produced original footage showing the Lusitania's last departure. These films may have been used later on, without the original intertitles. But it seems more likely this film was an independent release. 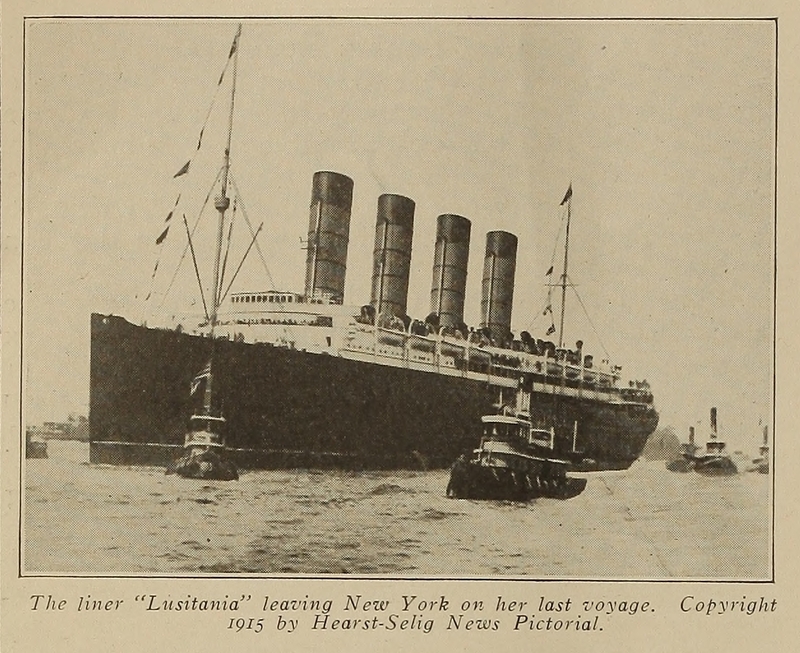 The trade paper Moving Picture World in its issue of May 29, 1915, has two very interesting references to a "special film" on the Lusitania's final departure which was sold on a state-rights basis and that was booked in film theaters across the country. Around May 10, 1915, for instance the film was shown in Detroit and in Kentucky. In addition, the records of the Pennsylvania State Board show there were two independent films that were censored at this time by this State Board: The Lusitania produced by Warner, distributed by Crescent, 1 reel, approved 5/20/15, and The Lusitania, produced by an unknown company, distributed by Electric, 1 reel, approved 5/17/15. "Warner" may refer to the Warner Brothers, who were already in the movie business in Pennsylvania during the 1910s. In short, the film print at the National Archives appears to be a copy of one of these independent releases, which would also explain why there are no references to a regular newsreel company. ""Next to be considered is the well-known film footage which shows Lusitania backing away from Pier 54 in New York that purports to be her 'final departure.' Because of changes in the lifeboat arrangement and various structural alterations made to Lusitania after August of 1914, there can be no doubt that the film footage is from her last few months of service. We also know from existing evidence that it could not have been taken between August and November, 1914. The film clearly shows a light-painted superstructure and not the dark 'war grey' that is plainly seen in the Illustrated London News photos. Since the film must have been taken after November, 1914, a closer examination reveals clues that narrow down the date even further. For example, noting the water level against the pilings under Pier 56, opposite the cameraman, it is definitely very near high tide. A quick check of the tide charts published in The New York Times each day tells us that for Lusitania's monthly sailings between December, 1914, and May, 1915, it was near high tide only twice -- April and May. The December, January, February, and March sailings were closer to low tide. Is it the last voyage? Can't say for sure, but there's a 50/50 chance. I'd sure like to think it is, though...."
Here is this news film, as shown by C-SPAN3 on American History TV. 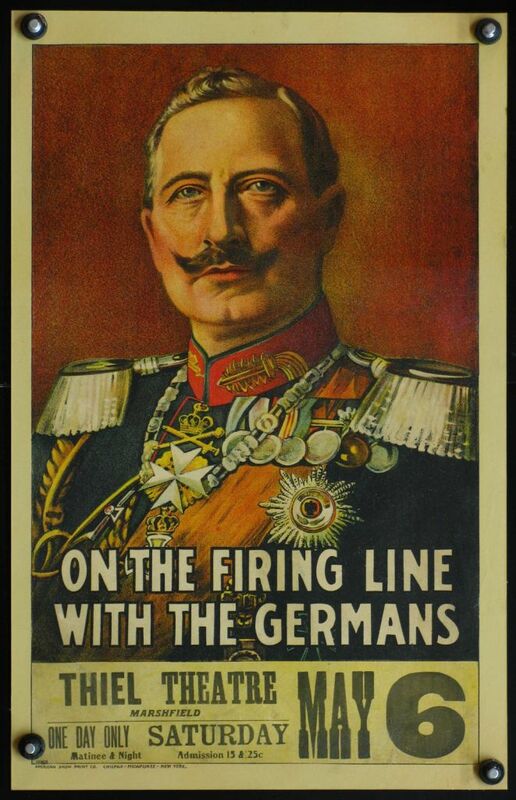 Next Saturday 10pm & Sunday 4pm ET C-SPAN3 will broadcast On the Firing Line with the Germans, a 1915 silent film. Here is a teaser of C-SPAN’s upcoming TV show that was posted on the internet today. This historic World War I film was shot by American journalist Wilbur Durborough and his cameraman Irving Ries. They traveled with the German army to East Prussia and Poland where they covered the offensive on the Eastern Front. You will learn about how the once-lost film was rediscovered and restored by the Library of Congress. Watch the entire film, with commentary by authors Cooper Graham and Jim Castellan who helped reassemble a fascinating World War I movie that had become a jigsaw puzzle of fragments. According to the Internet Movie Database, the Mutual Film Corporation in 1916 released Fighting the War, a two-reel short produced by Donald C. Thompson. Taken from a 35 mm print and made available for the public domain after 100 years, the movie jumps right into the European war with footage of Algerian and Scottish troops moving to the front lines during the Battle of Verdun. The footage runs for 23 minutes and captures troop movements and preparations, munitions handling, equipment transport, large artilliary guns, life in the French trenches, enemy gas measures, observation balloons, French and British aircraft, and actual battle footage on the ground and in the air. Among the surprises for World War I laymen is the French Army’s use of compressed air machinery for rapid tunnelling under the German trenches, presumably to lay explosives. A close examination shows that Thompson sold parts of a film to Mutual, which he had marketed before: War As it Really Is (1916). Although not all scenes from Fighting the War are identical the shots showing French infantry during a trench engagement had been shown before in Thompson's movie War As It Really Is. There are no contemporary references in the trade press to Mutual releasing Fighting the War. The film also isn't listed in the catalogue of the American Film Institute, so it remains an enigma how this movie was distributed in the United States. Scenes from Thompson's film War As It Really Is (1916) have been shown in an earlier weblog. Here are some scenes from Fighting the War, uploaded on our YouTube channel. John Silas "Jack" Reed hardly needs an introduction. Best remembered for his first-hand account of the Bolshevik Revolution, Ten Days That Shook the World, Reed died in Russia in 1920 and was buried at the Kremlin Wall Necropolis. His war reports also reveal a tantalazing glimpse on how for the first time in World War I the Germans made official movies at the Western Front. 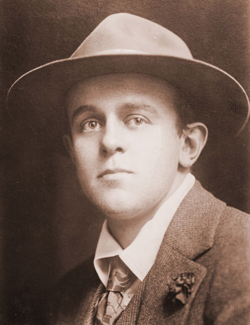 When the First World War broke out Reed immediately went to Europe as a correspondent of the Metropolitan Magazine, visiting England, France, Switzerland, Italy, Germany and Belgium. While in Europe Reed was frustrated by wartime censorship and the difficulty of accessing the front. He spent most of his time drinking with French prostitutes and pursuing an affair with a German woman. The pair went to Berlin in early December 1914. And this was when he got an invitation by the German Foreign Office for a trench tour to the Western Front, together with a number of other American reporters. This trip to the Western Front by the American journalists was filmed by American cinematographer Albert K. Dawson and an Austrian newsreel cameraman, Hans Theyer. The film project was set up by the German authorities to show the world that the Belgian people were treated decently, thus trying to disprove the stories on atrocities committed by German soldiers in Belgium. Scenes from this movie were found by the authors while researching our book American Cinematographers in the Great War. You can read more on this historic film in our latest book. Dawson in Belgium, January 1915. 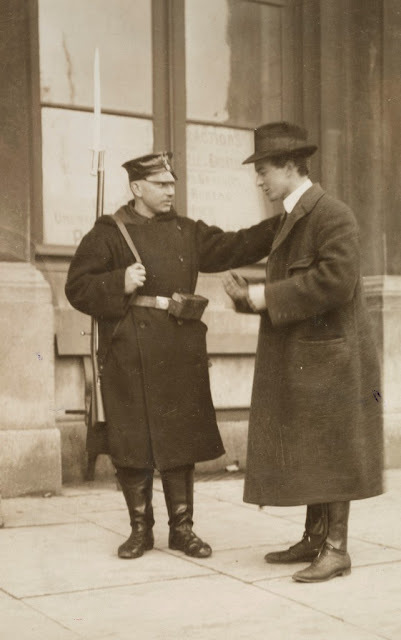 The original caption reads: "An American correspondent arrested by a German guard in a Belgian city". The picture was probably staged and may have been taken in Brussels. Copied from the files of the National Archives in Washington, D.C. In a city of Northern France occupied by the Germans, we were met at the train by several officers and the Royal automobiles. The officers, genial, pleasant, rather formal young fellows in the smart Prussian uniform, were to be our guides and hosts in that part of the German front. They spoke English well, as so many of them do; and we were charmed by their friendliness and affability. As we left the station and got into the machines, a group of private soldiers off duty loitered about, looking at us with lazy curiosity. Suddenly one of the officers sprang at them, striking at their throats with his little "swagger stick." "Schweinhunde!" he shouted with sudden ferocity. Be off about your business and don't stare at us!" Another time a photographer of our party was interrupted, while taking moving pictures, by a sentry with a rifle. "My orders are that no photographs shall be taken here!" said the soldier. The photographer appealed to the Staff Lieutenant who accompanied us. "It's all right," said the officer. "I am Lieutenant Herrmann of the General Staff in Berlin. He has my permission to photograph." The sentry saluted, looked at Herrmann's papers, and withdrew. And I asked the Lieutenant by what right he could countermand a soldier's orders from his own superior. "Because I am that soldier's commanding officer. The fact that I have a Lieutenant's shoulder-straps makes me the superior of every soldier in the army. A German soldier must obey every officer's orders no matter what they may be." The full story by Jack Reed on his trip to the Western Front in January 1915 is available for download here.